This text was originally published in Russian in the web-journal ReLevant: a Journal of Current Analysis. We are much obliged to Maria Brock for its English translation. Anyone who has crossed paths with Soviet immigrants in the West will have noticed the strange phenomenon of post-Soviet racism, which is all the stranger because the overwhelming majority of emigrants from the Soviet Union are “individuals of Jewish origin,” that is, people who not only faced quotidian and structural racism, but who also ended up fleeing from it. Dr N was pensively stirring his cappuccino, which had long gone cold. We were sitting in a small Italian restaurant not far from my university campus. 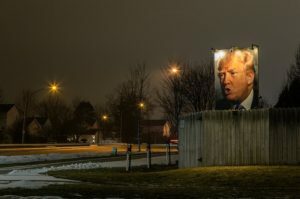 A few days ago Donald Trump had been elected President of the United States, and most of my American colleagues, friends and acquaintances were still in a state of deep shell-shock. N is a famous psychiatrist, professor and head of one of the leading neuropathological hospitals in Boston, but our acquaintanceship had nothing to do with his professional activities. I invited N to a restaurant in order to express my gratitude for a priceless gift he had made to our university, namely a huge personal archive of materials relating to the history of the human rights movement in the Soviet Union. But why are they racists? In the 1970s, N’s family became engaged in the fight for the right of Soviet Jews to leave the USSR – an activity not without its perils. While still a medical student, N became an almost legendary figure in Soviet dissident circles, as he regularly visited the USSR as part of tourist groups, bringing over banned literature and samizdat while also making sure that the persecution of Soviet Zionists received international publicity. Natan Sharansky is a close friend of his family. N’s last visit to the Soviet Union ended with an unpleasant episode: during a tourist visit to Kiyv he and his wife were arrested by the KGB and spent two days under interrogation. Afterwards they were declared personae non gratae and expelled from the country. The next time N visited Russia and Ukraine was after the collapse of the Soviet Union. In part it is thanks to the efforts and tireless lobbying of courageous and principled activists such as N that thousands of Jewish families were able to leave the Soviet Union. Some thirty or forty years later, many have found a new home and a new life. Perhaps this does not apply to everyone, but for many of them the move to the US or Israel justified their expectations and hopes to realise their potential and to live without fear of being themselves. After the early difficult years of immigration, many of them became quite successful. Former inhabitants of Moscow, Leningrad, Kharkiv, Kiyv, Riga, and Vilnius found prosperity and obtained apartments, houses, country cottages, cars and holidays in the Caribbean. Well, of course not “all” of them, but….many. I think that practically anyone who has crossed paths with Soviet immigrants in the West will have noticed the strange phenomenon of post-Soviet racism. It is strange for several reasons: first of all, the overwhelming majority of emigrants from the Soviet Union are “individuals of Jewish origin”, that is, people who not only faced quotidian and structural racism, but who also ended up fleeing from it. Second of all, they moved to the West from a country where, even if they at times experienced racial discrimination as Jews, they at the same time (one of many contradictions of life in the Soviet Union) grew up against a background of constant anti-racist propaganda. So how is it that, once in the West, many educated individuals, who had been raised on the great classics of Russian literature, and whose childhood and youth had been full of trips to the theatre and the philharmonic as well as passionate debates about the relative achievements of Brodsky versus Mandelstam, how is it that this “flower of the intelligentsia” turned out to be so receptive to the ideas of social Darwinism? What is the origin of this hatred for the same ideas of human rights thanks to whose realisation their own exodus from the totalitarian paradise was made possible? Beyond preoccupying essayists and writers (Anya Ulinich, Gary Shteingart and Elena Gorokhova have all written in English about the racism that is so common among Soviet immigrants), over the last few years, the riddle of post-Soviet racism has also started to attract the attention of scholars. Researchers such as Viktor Shnirelman, Nikolay Zakharov, Svetlana Boltovskaya and a number of others have dedicated their scholarly careers to the study of Soviet and post-Soviet racism. Along the way they discovered surprising parallels between the open racism of contemporary Russian society and the racial prejudice among Russian and Soviet immigrants in the West. These studies demonstrate a stable tendency among former citizens of the Soviet Union to identify with politics to the right of the political spectrum. The peculiar irony here is that over the course of American history, the Jewish community has always tended to be associated with left-wing and liberal political forces. This is true even today, when the large majority of American Jews tends to vote for more liberal candidates. Barack Obama was immensely popular among the Jewish community in the US. However, among so-called Russian Americans, his popularity, to put it mildly, was rather less pronounced. During the last election, almost 80% of American Jews voted for Hillary Clinton. But if we turn to American Jews with a Soviet or Russian background, the situation changes dramatically. In legendary Brighton Beach, only slightly over 30% of the population voted for Clinton. There, Donald Trump’s lack of political correctness and tendency to make racist statement made him wildly popular even though much of the rest of the country’s educated population is horrified by his behaviour. Like any complex sociocultural phenomenon, post-Soviet racism and conservatism cannot be subject to a simplified analysis. Based on my own research, I am inclined to see at least one of the sources of such an anti-liberal world view in the particularities of the Soviet experience overall, and more specifically in the relationship between the Soviet state and the intelligentsia, of which a significant part was Jewish. The poison of Soviet propaganda? By the end of the 1960s, that is, by the time the movement demanding the right for Soviet Jews to emigrate emerged, the Jewish intelligentsia was concentrated in cities, while their relationship with the Soviet state became increasingly troubled. There were numerous reasons for this, from the history of Stalinist terror, particularly the post-war wave of anti-Semitism, the USSR’s increasingly hostile relations with Israel, to the everyday anti-Semitism that Jewish citizens experienced on the streets, in schools, in public transport and the army, together with the unofficial barriers to being accepted into universities and colleges, to be promoted at work, and so on. 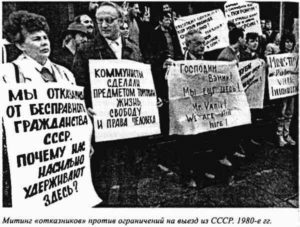 A refusenik rally against against restrictions for departure from the USSR (1980s). While a significant portion of Soviet Jews were sincere supporters of communism in the 1920s and 1930s, having been affected by pogroms and the Pale of Settlement under the tsars, this situation changed after the War. Having survived the anti-cosmopolitan campaign and the ‘Doctor’s Plot’, while observing the anti-Israel stance of the USSR, there were fewer and fewer reasons for Soviet Jews to feel at home in their country. Among urban elites, attitudes towards official propaganda and communist morals were becoming more and more sceptical. In his remarkable book Everything Was Forever, Until It Was No More, the former Leningrad resident and current professor of anthropology at the University of Berkley Aleksey Yurchak analyses this everyday game with the state that involved millions of people. Political slogans became ritual symbols and subsequently lost their original meaning, and ideological sincerity came to be replaced by ‘styob’ (satirical humour based on excessive use of official discourse), jokes and disdain. The intelligentsia largely ceased to take the state and its official ideology seriously. But how, you might ask, is this related to the hostility that your average, former philharmonic-loving woman from Leningrad and current well-to-do retired lady in Boston, feels towards the “uppity black monkey” Barack Obama? In my opinion, there is a direct link. 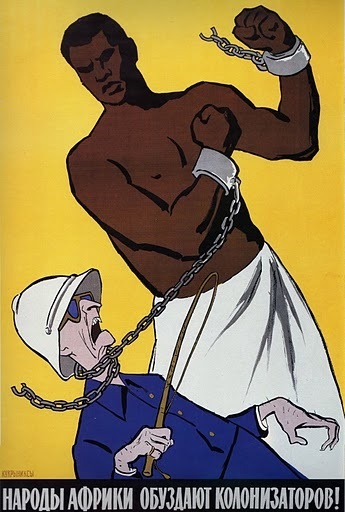 From the moment of its inception, one of the foundational elements of Soviet propaganda for the Bolshevik state was condemnation of Western racism and colonialism. Those who grew up in the USSR remember well the endless official campaigns in protest or solidarity, for example against Apartheid, for Lumumba, demanding the return of Paul Robeson’s passport or the release of the black communist Angela Davis, or against the “racist thugs in South Rhodesia”. 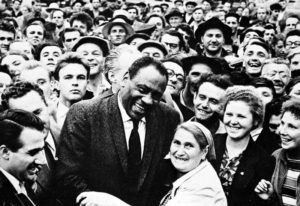 For less conformist members of the Soviet intelligentsia, these endless condemnations of racism were essential parts of the state ideology they so despised. As a result, this disdain was frequently transferred upon the subjects given special attention by Soviet ideologues, that is, the people of color of the postcolonial third world. Western activists fighting for social and racial equality were treated with scepticism, seen as ‘useful idiots’ enabling the persecution of dissidents and Jews by the Soviet authorities. 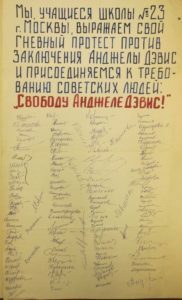 The Greek historian Constantin Katsakioris recently published research based on primary sources from archives in Moscow and Kyiv, where he clearly illustrates the hostility with which some Soviet citizens responded to the arrival of African students and other representatives of the so called Third-World to Soviet universities. Behind a façade of antiracist slogans and declarations in support of oppressed peoples lay a widespread disdain for those very oppressed. Such attitudes did not disappear with emigration to the West. On the contrary, they deepened. Soviet immigrants often brought with them a selection of rather predictable political views, a fundamental component of which was a hatred for the Soviet regime they left behind. Add to this weak language skills, a limited understanding of the particularities of Western political and social discourses, isolation from the cultural mainstream, including the local intelligentsia, and it becomes apparent why for many Soviet emigrants their natural political habitus and objects of identification became political movements and parties directly connected to traditional anticommunism, who assumed the most negative stance towards the Soviet Union. Practically everywhere in the West such positions were taken up by conservative parties. In the American context, for the last 20 years of the Cold War this undoubtedly meant supporting the Republican Party, above all during the presidency of the person so beloved of Soviet immigrants, Ronald Reagan. From the point of view of those fleeing the failed communist utopia, it was the Republicans who most closely represented ideas diametrically opposed to Soviet ideology and interests. These included a hardline foreign policy, anticommunism, unfettered devotion to the capitalist principles of private entrepreneurship, an unsentimental relationship with minorities and those considered “weak”, and a disdain for “socialist” Europe. A similarly important factor was relations with Israel, a country assuming for many post-Soviet Jews to this day the role of symbol of a triumphant realisation of the Jewish people’s national self-determination. For the majority of post-Soviet Jews, including those living outside of Israel, the Jewish state possesses an almost mythical status. Nothing is more important than its security, preservation and prosperity. Criticism of Israel is not tolerated. Such an uncompromising stance often perplexes more liberal American Jews who are raised on the principle of freedom of speech, and who cannot understand why support for Israel should not exist alongside a critique of the less pleasant manifestations of the country’s foreign and domestic policies. As liberals are more prone than conservatives to criticise Israel, they are a favourite target of hatred, with accusations of antisemitism readily thrown around, as well as accusations of sympathising with Arabs and Muslims. The hatred of the previously mentioned educated lady from Moscow/Leningrad/Kyiv/Chisinau for the figure of Barack Obama is a product of the historical and cultural processes described above. Her racism, along with that of hundreds of thousands of her former compatriots was formed in –what seems to me- a unique historical context. This context was marked by isolation from Western culture and Western ideas about societal mechanisms, as well as by confrontation with the official internationalism and antiracism of the Soviet state. But back to the admirer of Tolstoy and Sholem Aleichem: for her, Barack Obama manages to embody several historical trends, amalgamating the image of a black moderate-liberal professor with a suspicious-sounding name into the image of an enemy. The Soviet Union may have ceased to exist long ago, but millions of people, including immigrants living in the West, still perceive reality through the prism of their Soviet experience. It is for this very reason that our philharmonic-loving lady and the majority of her real and virtual friends see Obama as a demonic figure, a Western left-wing intellectual and European-style socialist, indulging “dirty” Arabs and Muslims who hate Israel, and all the while destroying the fundamental pillars of capitalism. This is also why this lady turned out to be so susceptible to the conspiracy theory (promulgated, among others, by Trump) regarding the 44th US President’s supposed African birth and Muslim faith. Naturally, seen through such a phantasmagorical lens, little remains that would resemble American political reality, but the truth becomes murky when one’s world view has been formed on the basis of convictions and prejudices going back to childhood. After all, he is black, which must mean he is red. It’s hard to argue with optimists, especially when one so desperately wants them to be right. It was time to say goodbye. We hugged and went our separate ways – we lived on different metro lines. Maxim Matusevich is a Professor of History and the Director of the Russian and East European Studies Program at Seton Hall University, New Jersey.